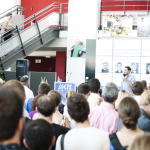 On 06/30/2015, the Karlsruhe founders’ scene met at the Audimax for the second KIT Venture Fest of the KIT Founders Forge. Our celebration revolved around business startup and young entrepreneurs. The diverse program brought students and scientists together with founding intentions, founders, investors, and the regional network. The day began with a founders’ breakfast where the first participants, contributors, and network partners were able to get to know each other. After this, the day continued with workshops and seminars. There was a lot of input for both people interested in founding and founders, as there were suitable topics for all stages of founding: from legal and fiscal aspects of a startup through to typical marketing mistakes and pitch training ranging to capital acquisition using venture capital or crowdfunding. Topics, such as patents, management, and innovation, were especially interesting to scientific founders. After the technical contributions, the Venture Fest officially opened in the afternoon. 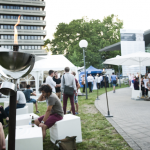 Prof. Dr. Orestis Terzidis and Dr. Jens Fahrenberg greeted the numerous guests and honored the winner of the “Walk of Flame” idea contest, Noémie Muller, with her “Allee der Lichter” (Alley of Lights). 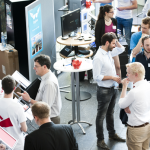 Additional visitors came to the founders’ gallery, where selected startup teams, KIT university groups, and network partners held presentations. The gallery offered the exhibiting teams a stage for receiving feedback on their business ideas and for establishing interesting contacts with supporters and investors. There was also a lively exchange between founders to share experiences of the startup process. For those that hadn’t met all KIT founders at the founders’ gallery, the KIT founders’ pitch gave a more precise overview. Eight selected teams from different industries competed in the pitch and gave all they could to convince the jury and the audience: Campusjäger, CubusLab, easierLife, enCourage, Gin, IneraTec, Optonaut, and OTEGO. A qualified jury made a final decision, while the audience voted for their favorite with play money. 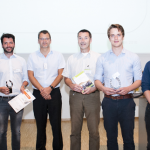 The jury was composed of Dr. Elmar Dorner (SAP SE), Dr. Friedrich Georg Hoepfner (Hoepfner Bräu), Dr. Torsten Löffer (High-Tech Gründerfonds), Dr. Jens Ortgiese (KIC InnoEnergy), Frank Schüler (KIZOO), and Alexander Stoeckel (b-to-v Partners). An evening program entertained the guests while they waited for the announcement of prize recipients. 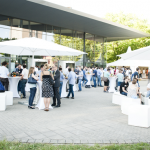 Here, all participants of the Venture Fest and the guests of our partners of the Karlsruhe Gründerallianz (Founders’ Alliance), which was part of the Karlsruhe Gründersommer (Founders’ Summer) at the KIT, gathered. The evening program began with a keynote speech by Prof. Dr. Günter Faltin titled “Wir sind das Kapital” (We are the capital). 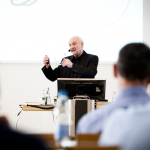 The founder and business angel highlighted some systematic methods for founding, which he has summarized in his latest book. For instance, he spoke about founding with components by increasing division of labor. Specialized tasks are given to those who have a good command of them and will be able to quickly realize them. This way, startups reach a degree of professionalism in a shorter amount of time. 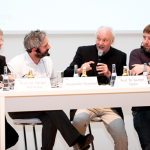 Subsequently, Prof. Faltin participated in a panel discussion with Prof. Dr. Holger Hanselka (President of the KIT), Alexander Stoeckel, and Tobias Knecht (abusix). Titled “Köpfe, Kapital und Kultur” (Heads, Capital, and Culture), this discussion provided insight on the ecosystem for founders at the KIT. 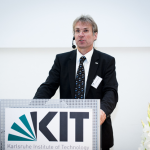 The prize ceremony for the 2015 KIT Founders’ Pitch was the finishing touch of the evening program. 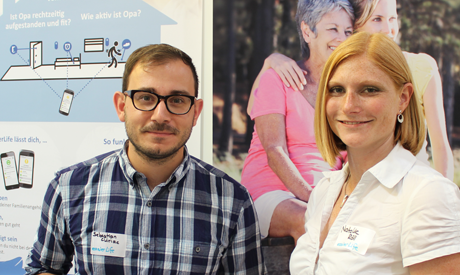 Campusjäger unanimously convinced the jury winning first prize, while the OTEGO team reaped two prizes, the audience award, as well as the prize for best energy idea. 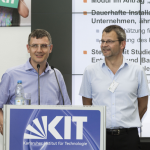 The prize money for the 2015 KIT Founders’ Pitch was provided by courtesy of KIC InnoEnergy and KIT Innovation gGmbH. The perfect summer weather accompanied the following get-together with a BBQ buffet. This provided another opportunity to exchange thoughts about the event. We want to thank the numerous guests who made the 2015 KIT Venture Fest a success! Special thanks go to the lecturers, founders, and companies who invigorated our program with their participation. 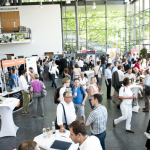 We would also like to thank our sponsors KIC InnoEnergy, PricewaterhouseCoopers, and SAP SE as well as our network partners Karlsruhe Gründerallianz, High-Tech Gründerfonds, Sparkasse Karlsruhe Ettlingen, venture forum neckar, and KIT Innovation.